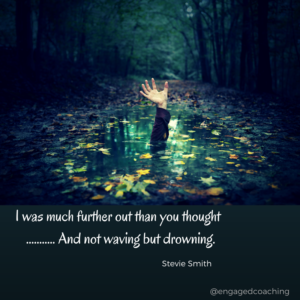 Engage Coaching & Consulting | And not waving, but drowning! It’s a mad world and it seems to be only getting madder. Madder, and also faster, less certain, increasingly inequitable, and more divisive. All conditions which neuroscience shows can drive our primal brains into a very unhappy state. Within this environment employee engagement is also increasingly recognized as a driver of workplace performance, and this has a downside when organisations define engagement, as they often do, as being willing to go above and beyond what’s expected. Those employees who get to work early, stay late and are always connected are often seen as valuable assets. However, this is a recipe for burnout, not for sustainable high performance. How do you recognize when you, your colleagues or staff are running on empty? And how do you promote the physical, emotional and social well-being of your people in such an environment? If you are not paying attention to these issues already, it may be time to consider changing that. The guys at Habits at Work (* full disclosure I know them and love their work!) have systematically reviewed tons of research about what really works to drive engagement and performance in the workplace. Their team of actuaries and researchers in their Behavioral Research and Applied Technology Laboratory (or BRATLAB for short) spend their waking hours investigating the habits that lead to thriving employees, delighted customers and flourishing companies. Over the last 20 years their key finding is that businesses flourish as a result of investing in their people. Employees who are healthy, happy and (financially) secure generate sustained, high-quality performance. “Performance” in this context is defined as the ability, energy, stamina and mental capacity to do great work, to be resilient in the face of set-backs, to be engaged in your work and to remain highly focused on a set of important work and life tasks. Nice, right? The most common element they’ve found among these factors is that they are all driven by our habits (what they call pivotal): the repetitive actions we take each day. HEALTH: Movement and being active is probably the most critical of all practices for it’s impact on a variety of factors like cognitive function, error rates and stamina, in addition to all the more well known health benefits. When your employees start taking on the challenge to be more active throughout the workday, you’ll notice a difference in engagement, energy and performance. Some of the stats are amazing. Forty minutes of walking three times per week improves episodic memory and executive control functions by 20%. In one study, complex decision-making improved by 70% in response to exercise. Mental errors of fit workers on concentration and memory tasks fell 27%. If you can only do one thing for your employees, get them to move more often during the workday. HAPPINESS: Fostering positive relationships with others may often be described as cultivating trust at work, having a good culture and the importance of having positive relationships inside and outside of work. Just a few very strong relationships can have a tremendous impact on the longevity of your life and on the quality of experiences you have. In addition, performing simple random acts of kindness, like buying someone a coffee, is a simple way to foster a momentary positive interaction with another human being. So is practicing mindfulness, generosity and self-compassion. Another critical practice is using your own signature strengths. Spending time on building rapport, ensuring processes that support trust and allocating resources to soft skills and relationship building all have a significant return on investment. FINANCIALLY SECURE: Managing personal finances encompasses learning money management skills and applying them to create a budget and pay down debt, an important, yet often overlooked performance driver. When employees are not properly managing their finances, their stress levels are significantly increased and their productivity declines. Especially in these increasingly difficult economic times helping develop skills amongst staff to enable them to manage their money well can have an enormous pay-off in terms of productivity. These are three things to try that have strong evidence which supports their value in increasing productivity and performance. We’d love to know what you’ve tried? What worked and what was less successful?